This graphic is a time line of my career path. It's an attempt to visualize my resume in a more meaningful way. 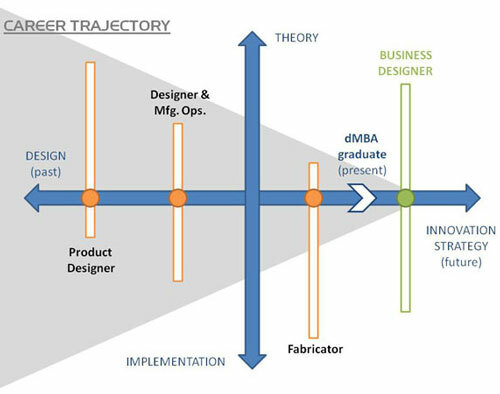 At this point in my career I want to blend my depth in product design (theoretical) with my depth in fabrication/manufacturing (implementation) and my MBA Design Strategy (innovation) in order to design business. Throughout my career I have witnessed a disconnect between the intent of design and its execution in business. This misalignment limits the ability of meaningful solutions to reach customers as intended, and the ability for businesses to realize the full financial and brand value. I believe the key to successful innovation strategy lies in a combination of systems thinking, process oriented design, and business acumen. So when I say I'm interested in designing business, what does that mean? Literally: designing businesses and/or parts of businesses. I want to apply design strategy and broader principles of innovation to business practice and decision making.This nature of this approach is deliberate, user centered, functional, meaningful, long term, sustainable, financially viable and relates the the context and goals of the company. In particular, I want to facilitate the dialog between the design and business worlds in order to create better outcomes for customers and companies. The MBA Design Strategy was a well timed gift for me. I chose the program because I knew it would help me synthesize the language and practice of design and business so that I might fulfill my goal to bridge the design-business gap and facilitate building a future grounded in design thinking. I have a special interest in data visualization of combined qualitative and quantitative data for decision making.